Full service connected car product with Real Time Car GPS tracking, LIVE MAP, 60 SECONDS REAL-TIME GPS with 30/15 seconds GPS update upgrades available. No battery needed! Draws power from OBD-II port. Goes to sleep after car ignition is off but wakes up once in every hour (when the car-ignition is off) to update location in your account and then goes back to sleep again. GET VYNCSFLEET FOR COMMERCIAL FLEET MONITORING OR TRACKING MORE THAN 5 VEHICLES. $10 one time network activation fee. 3G (also supports 2G) wireless connection supported in 38 countries including all 50 US States, Puerto Rico, Mexico, and Canada. SIM CARD INCLUDED ALONG WITH 1 YEAR DATA PLAN FROM THE DELIVERY DATE. SAME AMOUNT FOR RENEWAL IN THE SECOND YEAR (RENEWAL FEE INCLUDES SERVICE AND DATA PLAN FOR THE SECOND YEAR). 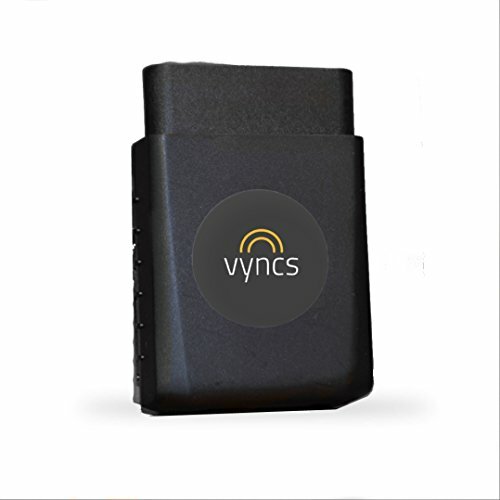 Vync Pro is standard Vyncs plus 60 sec GPS, Live Map refreshing map automatically as vehicle moves, 1 year roadside assistance in US, Canada, Puerto Rico. Real-time Geofence zone, OBD diagnostics, maintenance, recall, fuel economy, fuel level (if available). Curfew Hours notifications upgrade. Driver speeding/braking/rapid acceleration alerts by Push Notification/Email and SMS (upon request), trip history, driving score. Tamper alert sent once device is plugged back into OBD after it is removed. Works in 38 countries: USA, Canada, Puerto Rico, Mexico, Austria, Belgium, Brazil, Bulgaria, Croatia, Cyprus, Czech Republic, Denmark, Faroe Islands, Finland, France, Germany, Greece, Hungary, India, Ireland, Italy, Latvia, Lithuania, Luxembourg, Malta, Mexico, Netherlands, Poland, Portugal, Puerto Rico, Romania, Saudi Arabia, Singapore, Slovakia, Slovenia, Spain, Sweden, and United Kingdom.